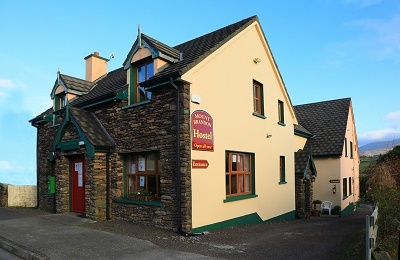 Mount Brandon Hostel is located at the foot of Brandon Mountain along the Dingle Way walking route and on the Wild Atlantic Way driving and cycling route. The hostel is situated in one of the most scenic and unspoiled regions of Ireland. A hill walker's paradise for both the discerning hill walkers and the casual walkers, it affords you breathtaking views of both the valleys and hills surrounding the mountain and Birdseye views of Tralee Bay and its fantastic beaches, ideal for surfing and angling. The area is also renowned for its fishing, both river, lake and sea, offering you an experience you will not forget. Mount Brandon Hostel is located in the lovely village of Cloghane on the Dingle Peninsula, in the Kingdom of Kerry in South West Ireland. Its at the foot of Mount Brandon and overlooking Brandon Bay. There are two village pubs, full of character with regular music sessions and both serve good food. We have something for everyone with Single, Double, Twin and Family rooms all en-suite. We cater for groups up to 45-ish, for parties, celebrations, re-unions, school trips. Many thanks to the Photographers for permission to use the photos used in the slideshow. Check them out here.